String theory is a leading candidate for a "theory of everything", but there is not a scrap of experimental evidence for it and no obvious way of getting any, either now or in the foreseeable future. The whole awe-inspiring edifice has got "caught up in its own mathematical beauty", according to a review of Lee Smolin’s new book in the latest issue of Physics World. Some string scientists have even begun to justify their evidence-free efforts, writes Michael Riordan, by offering a new philosophy of science "in which hypotheses no longer require observable evidence in order to be accepted as valid theories." To a hardened experimentalist like himself, he says, "this is blasphemy". It’s an unfortunate choice of word, since it seems to concede the relativist position that science is no better than any other story we tell ourselves, or read in ancient texts, while trying to make exactly the opposite point - that unlike other belief-systems science is firmly based on solid evidence. "If we accept string theory as valid while it evades observational tests, how can we legitimately rebut arguments about the ‘intelligent design’ of the universe? The honest answer is that we cannot. For these arguments too are not falsifiable; they do not allow testing by measurements." And yet and yet… What is and isn’t science is not always clear-cut. The scientific method police can get a little too keen. 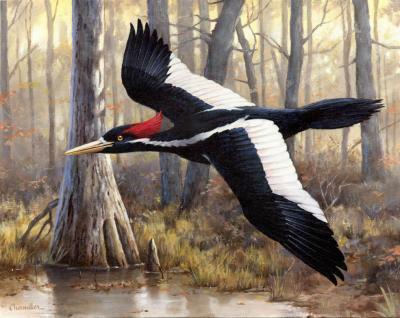 Scientists from Texas A&M and UC at Berkeley have just set up a "high-tech sentinel" in the Arkansas bayou, to hunt for the ivory-billed woodpecker. The bird was believed to be extinct, but recent sightings suggest reports of its demise have been greatly exaggerated. But the evidence is inconclusive. So the scientists have designed an intelligent video camera and image filtering system, which they are prepared to leave searching the woods for the elusive woodpecker for years and years and years. Well patient search by people who call themselves scientists is a common activity, whether the objects sought are woodpeckers, gravitational waves, Higgs bosons or the Loch Ness Monster. But it’s not an activity that fits easily into the scientific method slot. The scientific method was best described by Richard Feynman in a 1960s lecture to a classful of awestruck students: "In general we look for a new law by the following process. First we guess it. Then we compute the consequences of the guess to see what, if this law we’ve guessed is right, that this would imply. "Then we compare the computation results to nature ... compare it directly with observation to see if it works. If it disagrees with experiment it’s wrong. In that simple statement is the key to science. "It doesn’t make any difference how beautiful your guess is. It doesn’t make any difference how smart you are, who made the guess, or what his name is – if it disagrees with experiment it’s wrong." What the woodpecker watchers are doing bears little resemblance to that model. 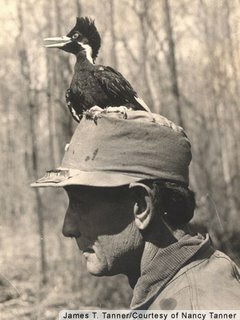 Their hypothesis that the ivory-billed woodpecker survives somewhere in the bayou is not falsifiable. No real-world test could prove it wrong. So are their efforts not science? "I take the hard view that science involves the creation of testable hypotheses," says Michael Crichton. "The Drake equation cannot be tested and therefore SETI is not science. SETI is unquestionably a religion." But SETI pioneer Frank Drake is equally robust: "There is no way by our search that we can prove there are not intelligent creatures in space. Even if we made the most extensive possible radio search and found nothing, perhaps there are civilisations out there which don’t transmit radio. "So we cannot prove the negative. And some people say that means SETI is not science. Well, I think that’s just playing games with words." I agree with Drake*. And not just because Crichton is better at science fiction than fact - being the best-selling author of Jurassic Park and a prominent climate-change denier. But it does leave you wondering exactly what is science and what isn’t. And who decides. If we insist on the scientific method, that consigns intelligent design and string theory to the fairy-stories file, but it also takes out SETI and the woodpecker watchers, among a host of other honest endeavours. If we relax the criterion too much, we open the door to the cargo cults, a supernatural designer with a strange fondness for hairless monkeys, and far more parallel universes than there are particles in the one we are just beginning to know. Going back to my previous post, it's easy to figure out what art is. Art is what artists do and call - or sometimes don't call - art. So is science whatever scientists do and call science? Quick quiz. Which are science? "I often think, as we’re observing and these little blips appear on the screen, that we are very much like people in the forest somewhere, with the wind blowing and the leaves rustling. Perhaps we hear in the distance human shouting, for a brief moment. But we can’t be sure. "It could well be that that’s exactly what’s happening in our galaxy."